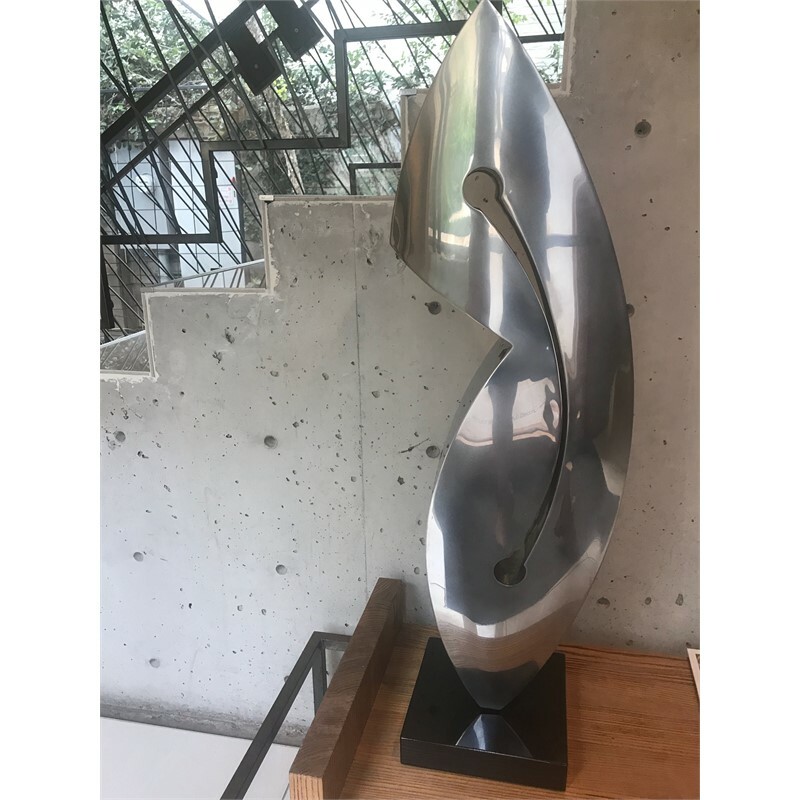 Working in both monumental and small dimensions, since the 1970s sculptor Gino Miles is inspired primarily by 20th Century European masters such as Moore, Brancusi, Archipenko, and Marini. Gino Miles distills his love of the classical figure and objects found in nature, working with a sparse and contemporary language that embodies tranquility. Stripped of an overt narrative, Gino Miles’ abstract forms achieve a poetic harmony of man and nature, with subtle references to both the human form and ancient cultures. Gino Miles became interested in painting and sculpture in the early 1970s at the University of Northern Colorado, where he also earned a Master of Art in Sculpture. He studied at Universita per i Stranieri in Perugia and the Accademia di Belli Art in Florence. A profound love of teaching inspired Miles to help establish Italart, a school for American and German students in the Chianti region outside Florence. After many years of study and work in Europe, the artist and his wife returned to the US and settled in Santa Fe, NM. Miles’ large-scale works are prominently featured in many permanent and private collections throughout the United States, Europe, and South America, including Evansville Museum, Disney Corporate Headquarters, the cities of Cerritos and Napa, CA, the City of Edmond, OK, and Western Kentucky University, Bowling Green, KY, among others. My work explores a deep, timeless aesthetic connection to the primal spirit of humanity. In minimalistic yet often monumental sculptures, I interweave references to science and natural phenomena with the passage of time. These works invite the viewer to look beyond the traditional constraints of form, composition, and space into a deeper world of possibility. 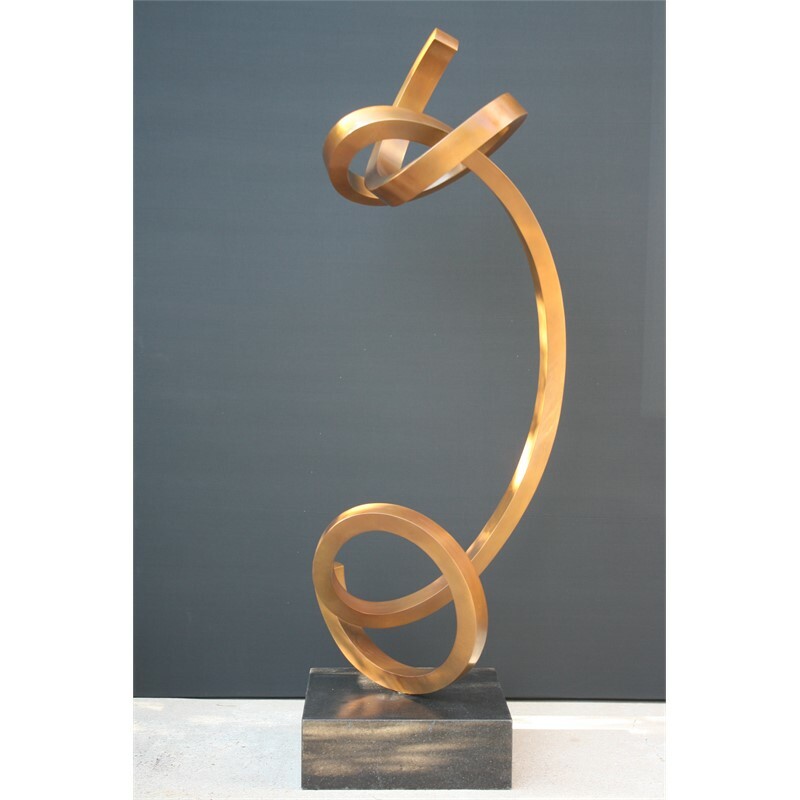 Currently working primarily in fabricated stainless steel and bronze, the curvilinear, often weightless appearance of my pieces creates a visual contradiction with heavy metal materials, challenging the fundamentally static nature of sculpture. 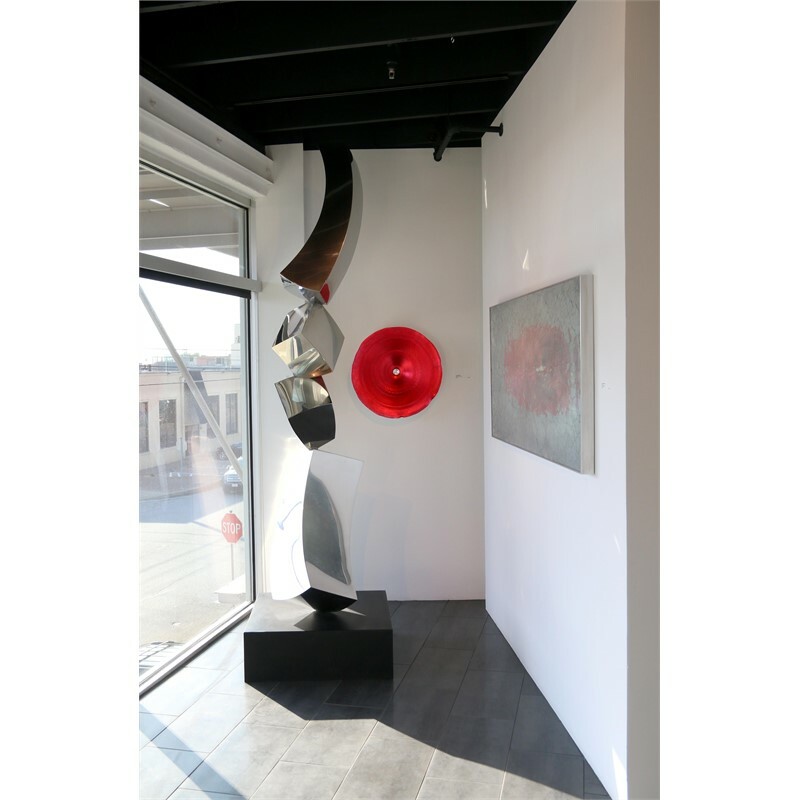 Many of my pieces are kinetic and can be turned, rotated, or even spun, allowing observers to change their viewpoint. Presenting such mass in motion with seemingly effortless fluidity invites a challenge to the viewer’s perception of the sculpture. My work focuses on elegant minimalism and cleanliness of line and shape, creating a timeless aesthetic. Inspired by the meandering and knotting of morning glory vines, I am fascinated by nature’s ability to weave itself so exquisitely into a knot—a historic symbol of unity and connection. My work also draws from studies of ancient cultures in Italy and Greece, including the ancient columns that symbolize humanity’s passage through time. Exploring the relationship between organic design and inorganic materials has led me to a strong conceptual balance of how things grow, bond together, and respond to their neighboring environment. I often choose materials, which can reflect, absorb, or blend with their surroundings. From blue skies to the reflection of the viewers themselves, each person’s experience will be entirely unique and the sculpture will forever respond to its current reality. This balance between timelessness and the ephemeral moment presents observers with an extemporaneous and poetic experience. 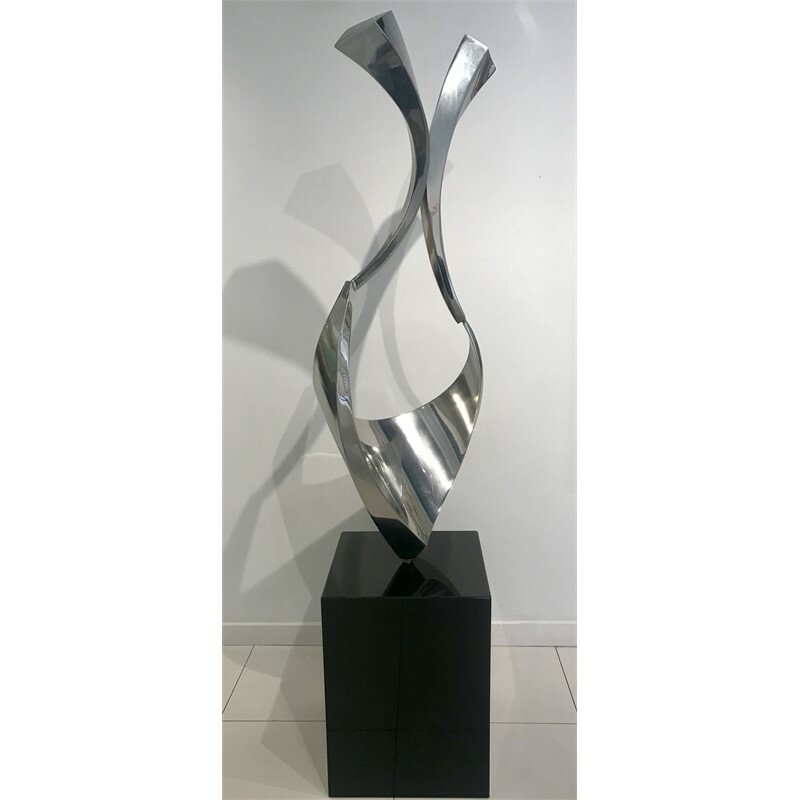 Even after more than forty years of sculpting, I still have an unquenchable thirst for creating sculpture, the urge to challenge boundaries and conventions, and a desire to inspire viewers for generations to come. “My work explores a deep, timeless aesthetic connection to the primal spirit of humanity. 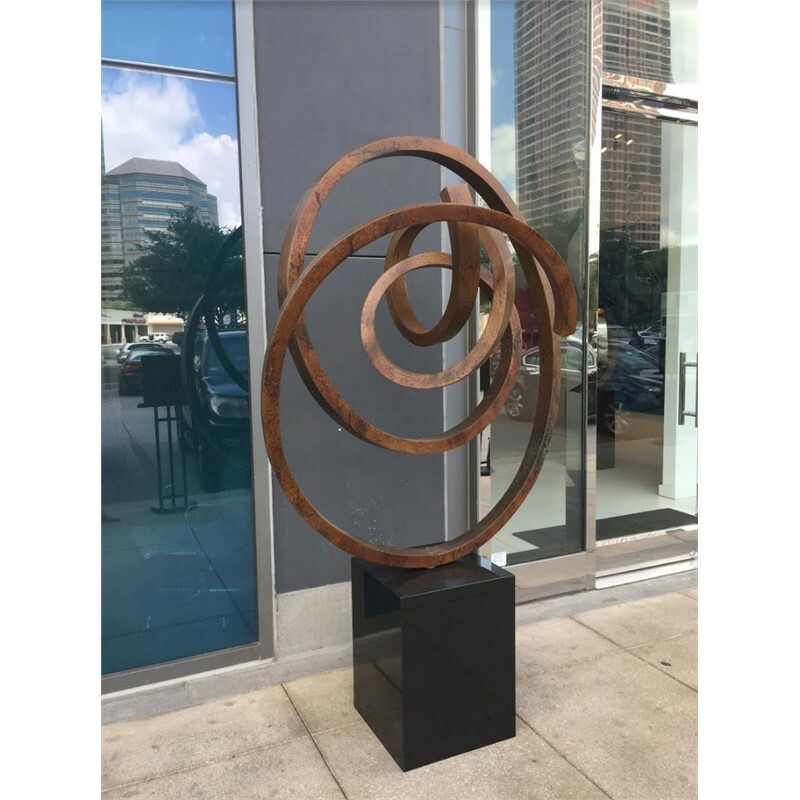 In minimalistic yet often monumental sculptures, I interweave references to science and natural phenomena with the passage of time.” -Gino Miles (American, b. 1952) Working in both monumental and small dimensions, since the 1970s sculptor Gino Miles is inspired primarily by 20th Century European masters such as Moore, Brancusi, Archipenko, and Marini. Gino Miles distills his love of the classical figure and objects found in nature, working with a sparse and contemporary language that embodies tranquility. Stripped of an overt narrative, Gino Miles’ abstract forms achieve a poetic harmony of man and nature, with subtle references to both the human form and ancient cultures. Gino Miles became interested in painting and sculpture in the early 1970s at the University of Northern Colorado, where he also earned a Master of Art in Sculpture. He studied at Universita per i Stranieri in Perugia and the Accademia di Belli Art in Florence. A profound love of teaching inspired Miles to help establish Italart, a school for American and German students in the Chianti region outside Florence. 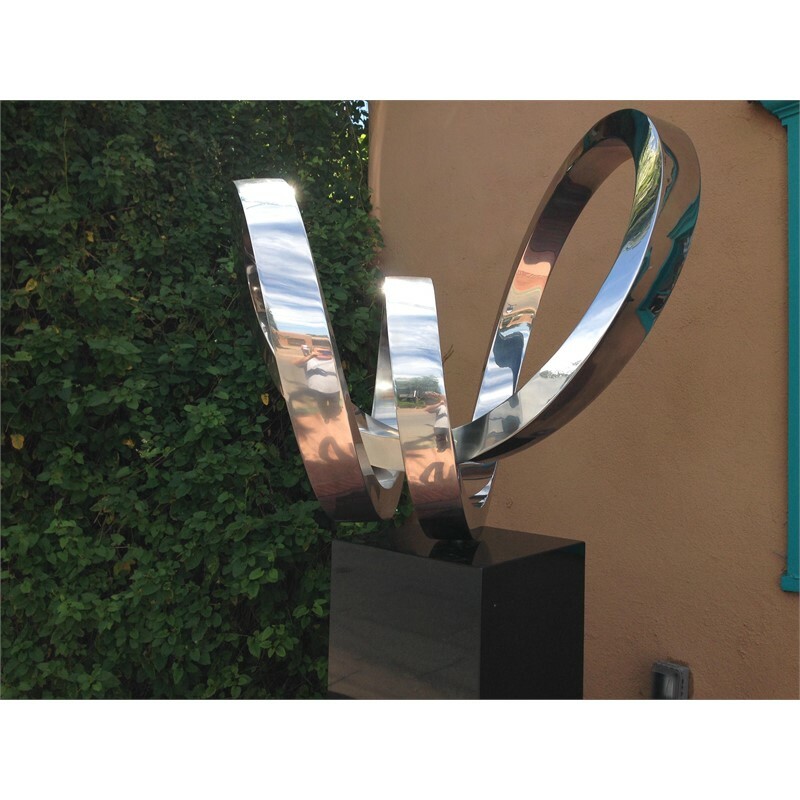 After many years of study and work in Europe, the artist and his wife returned to the US and settled in Santa Fe, NM. Miles’ large-scale works are prominently featured in many permanent and private collections throughout the United States, Europe, and South America, including Evansville Museum, Disney Corporate Headquarters, the cities of Cerritos and Napa, CA, the City of Edmond, OK, and Western Kentucky University, Bowling Green, KY, among others. STATEMENT My work explores a deep, timeless aesthetic connection to the primal spirit of humanity. In minimalistic yet often monumental sculptures, I interweave references to science and natural phenomena with the passage of time. These works invite the viewer to look beyond the traditional constraints of form, composition, and space into a deeper world of possibility. 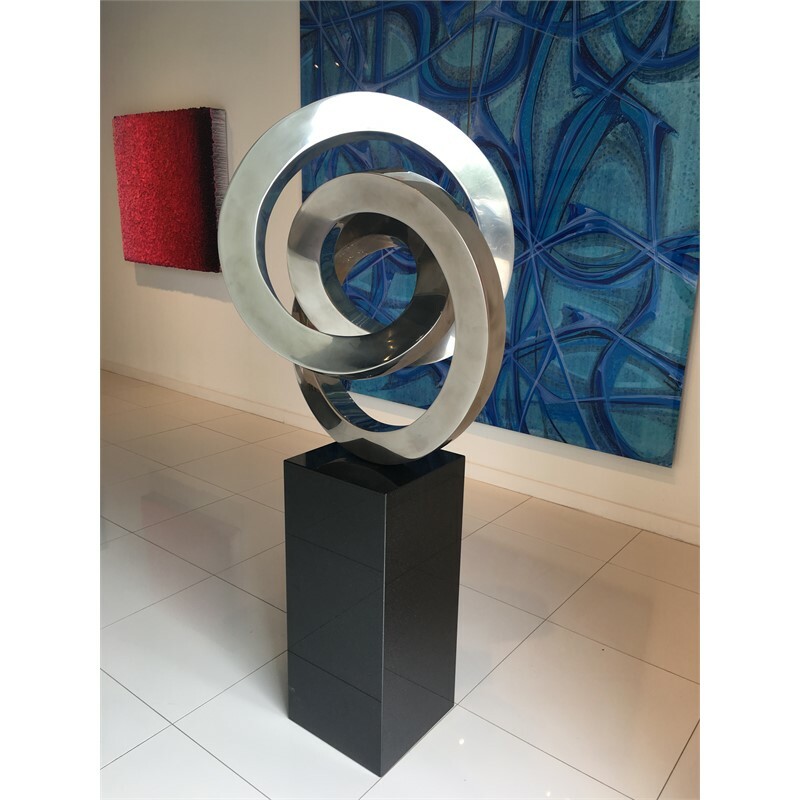 Currently working primarily in fabricated stainless steel and bronze, the curvilinear, often weightless appearance of my pieces creates a visual contradiction with heavy metal materials, challenging the fundamentally static nature of sculpture. Many of my pieces are kinetic and can be turned, rotated, or even spun, allowing observers to change their viewpoint. Presenting such mass in motion with seemingly effortless fluidity invites a challenge to the viewer’s perception of the sculpture. My work focuses on elegant minimalism and cleanliness of line and shape, creating a timeless aesthetic. Inspired by the meandering and knotting of morning glory vines, I am fascinated by nature’s ability to weave itself so exquisitely into a knot—a historic symbol of unity and connection. My work also draws from studies of ancient cultures in Italy and Greece, including the ancient columns that symbolize humanity’s passage through time. Exploring the relationship between organic design and inorganic materials has led me to a strong conceptual balance of how things grow, bond together, and respond to their neighboring environment. I often choose materials, which can reflect, absorb, or blend with their surroundings. From blue skies to the reflection of the viewers themselves, each person’s experience will be entirely unique and the sculpture will forever respond to its current reality. This balance between timelessness and the ephemeral moment presents observers with an extemporaneous and poetic experience. 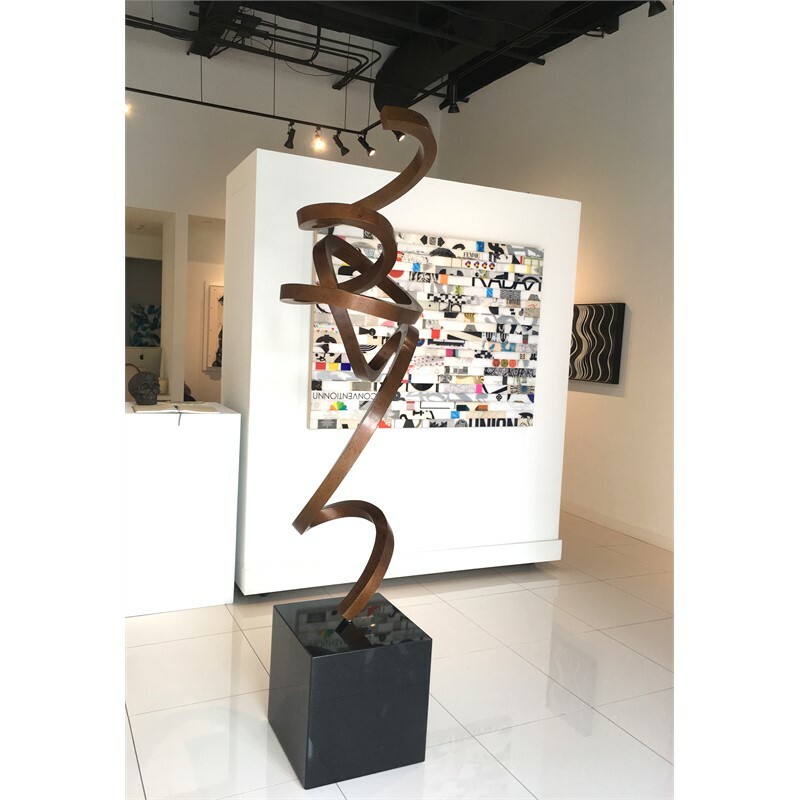 Even after more than forty years of sculpting, I still have an unquenchable thirst for creating sculpture, the urge to challenge boundaries and conventions, and a desire to inspire viewers for generations to come.